This was nick-named the "Impossible Railroad". It was built in the earliest part of the last century, finished in 1932 by John D. Spreckels, the sugar baron, with hopes of linking the harbor of San Diego to Eastern Markets. 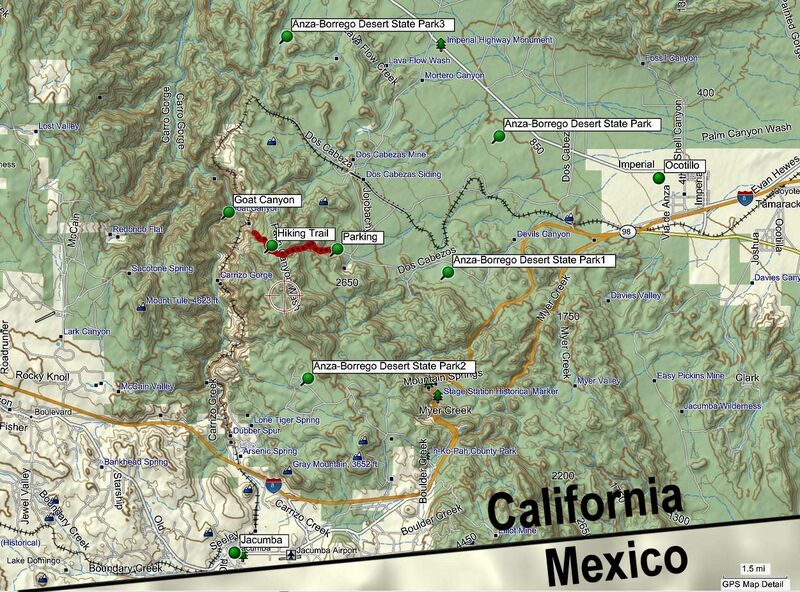 In later years it was going to be used to move goods out of Baja, to the East. It was originally named the San Diego and Arizona Eastern, it has gone bankrupt so many times it's impossible to list all the names it has gone through. At present, and for a multitude of reasons, no trains have run on this track for the last two years. There are several reasons that this has not worked out for previous and present owners. First the tunnels are collapsing and are in need of constant repair. 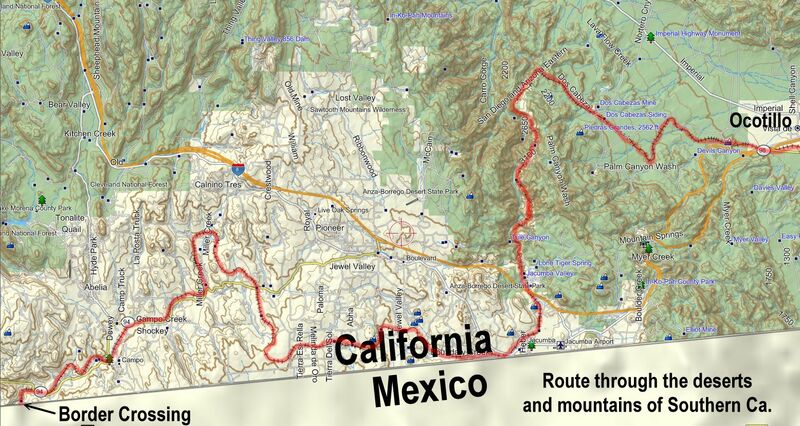 And now the most important reason: At the Western end of the track it crosses into Mexico. That means that the US would have to build an inspection station to inspect all incoming goods. This may never happen. 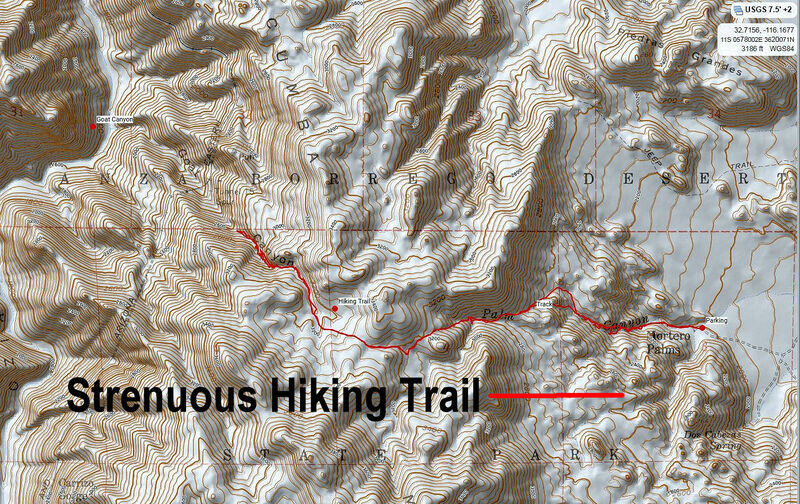 And finally, the route, if you look closely at the enlarged map provided HERE you'll see the zig-zag track (highlighted in RED ) that it follows through the mountains and this alone makes it undesirable. What makes this hike so interesting (why 100's have made this hike) is the sheer size and durability of the Goat Canyon Trestle. After all it is made of WOOD! Hard to believe that just a few years ago a locomotive with 2 flat bed trailer cars crossed the trestle. One of the flat bed cars was carrying a track hoe to clear some of the rock slides off the tracks. This was a masterpiece of engineering and is worth the hike in to see it. NOTE: Although 100's of explorers have hiked down the tracks to see this amazing trestle, it is your responsibility to find out if this is legal to do so! The hiking trail provided as a GPX track is a legal way to get to see the trestle and does not include hiking on the tracks. We will not be held liable for an illegal actions by your lack of knowledge.